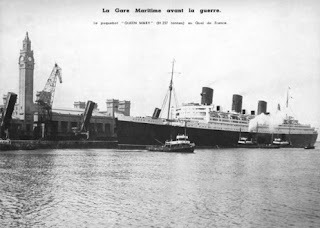 Disclosure recently that the Queen Mary was troop-carrying from Australia early in the war was not news to most people. When she first steamed into an eastern port hundreds of thousands of sightseers flocked to see her. To the A. I. F. men who were transported over, the Middle East run changing conditions on "the Mary" reflected the mounting tempo of Britain's prosecution of the war. 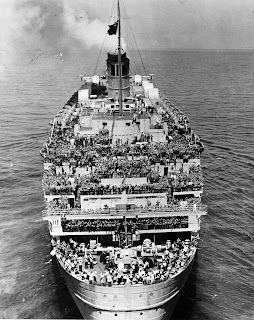 The world's third largest liner hastily impressed into troop-carrying duty, at first carried only a few thousand men; nowadays, with every square foot of cabin and deck space utilised, up to 14,000 soldiers have been accommodated. This metamorphosis from the last word in luxury, when three or four soldiers were quartered in lavishly appointed cabin suites, to a great ship converted by expert hands to handle more than a division of fighting men, has taken time. On each trip, changes were noticed. Instead of the two or three sittings at each meal, a new system was devised so that troops could eat and sleep in shifts. In the last three years, what has happened to "the Mary" has taken place on many of Britain's ships, which, although externally the same, are internally vastly different. There was only one drawback to being carried by this great vessel. Because of bulk and tremendous draught, "the Mary" was forced to drop anchor out in the roadsteads at various ports. Her soldier passengers were then forced to watch with chagrin men from smaller transports eagerly thronging ashore in strange places for a day's leave. One special occasion thousands of Diggers and Kiwis will remember vividly--some with misgiving. The convoy was steaming quietly through tropical waters when suddenly, after signal pennants had been run up, the ships began changing formation with precise movements. At the end of the evolutions, the disposition had so altered that Queen Mary was at the end of the line. Then her stem began slicing deeper into the sea, and the bow wave grew in size until two huge cascades of water were being thrown away each side. With every deck and vantage point of every vessel a cluster of men, "the Mary" swept down past the convoy at 30 knots. As she went, thunders of cheers were given and returned. Coo-ees and whistles grew fainter and less persistent as she sped into the distance--with the first troops to be taken to Malaya. I'm told that, for the first time ever, a film is to have its world premiere in mid-Atlantic. The Queen Mary is to show "The Adventuress" aboard on January 31. A week later the picture will also be shown on the Queen Elizabeth. The Queen of the seas as a £45-a-week floating holiday camp? It seems a startling idea at first glance. But that is one of the plans under consideration for the giant Cunarder Queen Mary, one of the most beautiful ships afloat and holder of the Atlantic Blue Ribbon in her early years of New York-Southampton service. She is twenty-six years old, a delicate age for a maritime lady, and her owners are giving her only another five years of profitable life in her trans-Atlantic role. Then the choice for the 81,000-ton beauty is the scrap heap--or what offers? Cunard chairman Sir John Brocklebank has his own ideas about her future, and they don't include the wreckers' torches. "I hate the thought of selling the Mary for scrap," he confessed in an emotional moment. "She is more than a ship--she is a way of life that is worth preserving." His own plan--still to be worked out in detail--is to sink her, in forty feet of warm Caribbean water, as a permanent, wave-lapped luxury hotel, connected to some island home by a giant flood-lit causeway. "There are many practical difficulties, but engineers assure me that these can be overcome. I should not change the outline of the liner one bit. I should like to preserve the masts, crow's nests and funnels." He added: "This is not simply a sentimental idea for turning the Queen Mary into a monument. The commercial possibilities also appeal to me. One of the public rooms could be turned into a top-class casino." The brightly-painted mistress of the seas would bring a little over $3,000,000 as scrap -- "and where would you get a magnificent hotel accommodating 2,000 people for that price?" Other ideas are being kicked around by the Cunard management, who must make up their minds on the Queen's replacement within the next 12 months. One is the plan of British travel entrepreneur Max Wilson to charter her on a five-year contract for cheap tropical cruises, similar to those he plans for the CPR Empress of Britain. But Cunard, unlike the CPR management, is dubious. It has provided him with facts and figures about her operation, and of Cunarders in Canadian service as well. "Some pretty insuperable difficulties" stand in the way of the deal. One is that the Mary, built for fast Atlantic crossings (her record is between four and five days), cannot go for more than six days without fresh water supplies. Therefore the proposal to use her for voyages to Japan is "pretty fanciful." British holiday camp king Billy Butlin has put still another idea forward--and has backed his proposal with hard cash: $3,000,000. It's for the outright purchase of the lady for conversion into a floating holiday camp off England's south coast. "I don't think the old liner should go abroad," said Mr. Butlin of Sir John's Caribbean plan. He thinks Devon would be a better place for her. But again, Cunard is undecided. "As the Queen Mary has at least another five years in service there is plenty of time to consider any offers," said a company spokesman. What concerns the famous shipping firm more at this point is the necessity of early decisions on her successor. The scheme under study is to build a new ship of about 55,000 tons--two-thirds the size of the aging lady--at a cost of about $60,000,000. She would have a speed of thirty knots, with aluminium superstructure to keep her weight down. Space would be provided for 1,850 passengers. "We must hasten slowly," cautions Sir John, "because we are building not for five or ten years ahead, but fifteen or twenty. "We believe there is a future on the North Atlantic for a superliner class of ship, providing she combines a high carrying capacity in the summer season to reap the density of traffic offering, with flexibility to operate profitably as a cruising ship in her own right during the winter months." This, at the Queen Mary's age, is more than the operators can hope to expect of her. QUEEN MARY RATED AS "CABIN SHIP"
LONDON, January 14.--A fantastic situation exists in North Atlantic shipping. 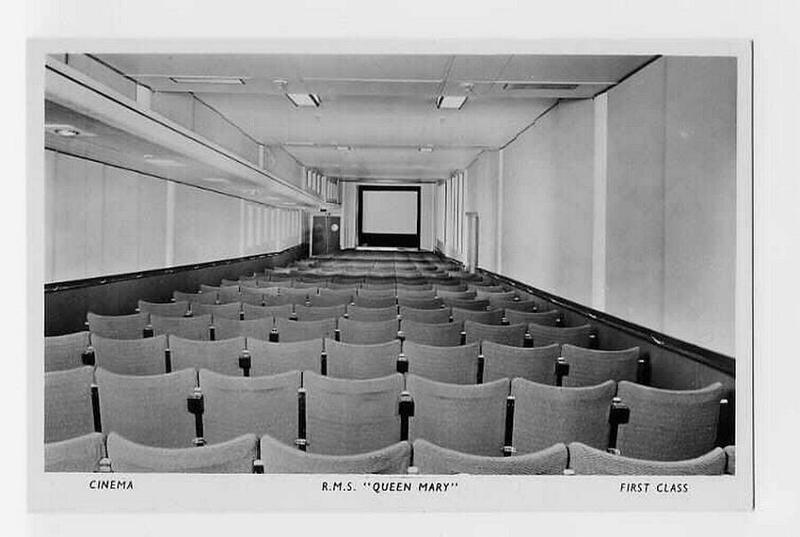 The Queen Mary, which will make her maiden voyage from Southampton to New York in May, is classed in the Atlantic Conference for rating purposes, not as a first-class vessel, but as a cabin ship. This means that the liner, which, judged by standards of size, types of accommodation and speed, may be regarded as the first ship in the British mercantile marine, [which] is ranked technically as something less than the best. 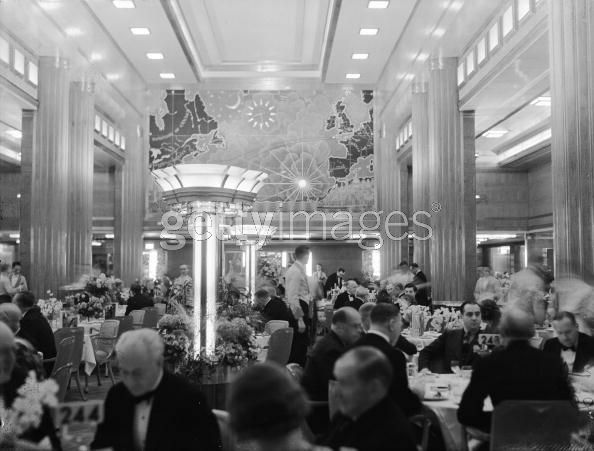 The Aquitania remains a first-class vessel. The Cunard-White Star Line has given notice of its resignation from the conference. It is expected that the outcome will be the reclassification of the ships of the Atlantic. Engineers in charge of the Queen Mary have prepared sectional plans of the bed of the River Clyde to facilitate the navigation of the great liner on her 15-mile journey from the fitting-out basin at Clydebank to the Firth of Clyde. Two tides will be used. Between them she will lie at an old Admiralty wharf at Old Kilpatrick, which is to be extensively reconditioned for the purpose. 5 a.m.--Ship afloat in fitting-out basin, ready for canting. 8 a.m.--After negotiating Old Kilpatrick bend--one of the most difficult manoeuvres of the voyage--the liner will close into the Old Admiralty Wharf to await the next tide at 7.15 p.m. 5.15.--The lines will move again. 6.30 p.m.--Passing Dumbarton: progress will be slowed to negotiate moving sand banks caused by the outward flow of the Riven Leven. 8 p.m.--The last obstacle--Cockle Bank at Port Glasgow--will be negotiated. At the Old Kilpatrick bend it is estimated that there will be only about 10ft. clearance between the river bank and the blades of the liner's propellers. The liner will be flooded for the journey to draw about 44ft. aft and 40ft. forward. To make her as light as possible all her lifeboats save two will be towed down to the tail of the bank and swung aboard there. Pilots Cameron and Murchie, who supervised the canting of the vessel into her fitting-out basin immediately after her launch, and who will be in charge of the operation, are confident that the river will be navigated without mishap. The Cunard-White Star Company have placed an order with the Vacuum Oil Company, Ltd., for the whole of the lubricating oil requirements for the main propelling machinery. The first delivery, of over 20,000 gallons, was made on December 23. Captain Sir Edgar Britten, Commodore of the Cunard White Star fleet and now in command of the Berengaria, has been appointed to the command of the Queen Mary, which is scheduled to make her maiden voyage to New York from Southampton and Cherbourg May 27. Sixty-one years of age, Sir Edgar Britten was appointed commodore of the fleet last year. He first went to sea in 1892, in a sailing ship, and is one of the few captains who has taken a master's certificate both for sail and steam. He joined the Cunard Company as fourth officer in the Invernia in 1901, and in 1913 secured his first command. Throughout the war Sir Edgar Britten was engaged in transport and hospital ship work. During these years he acted as staff captain of the Aquitania, and commanded, among other ships, the Lycia, the Tuscania, the Pannonia, and the Kursk. LONDON, Jan. 5. (A.A.P.) 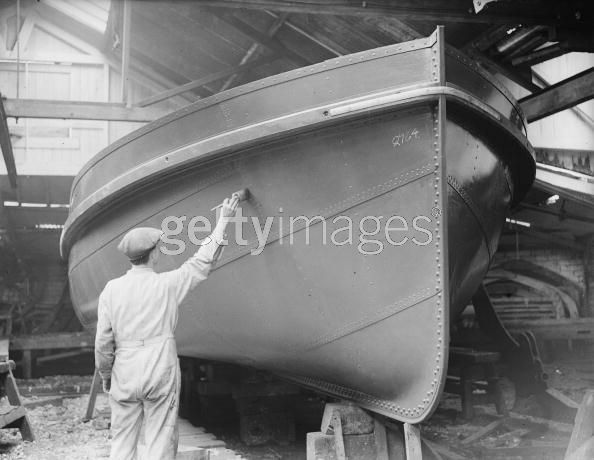 Divers, to ease the water pressure, put tallow round the rivets loosened in the Queen Mary. 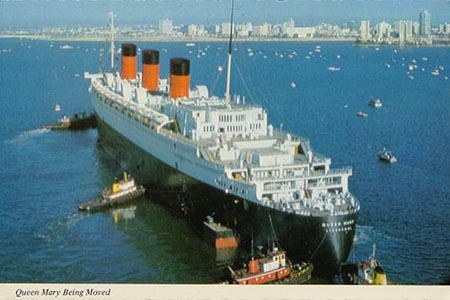 Cunard White Star Company officials said they were convinced that the grounding of the Queen Mary at Cherbourg was due to the liner catching an underwater cable in her anchor as she prepared to leave. While efforts were being made to clear the cable a gust of wind drove the liner aground. A French naval spokesman denied that the anti-submarine cable could have caused the vessel's grounding. He said there was no anti-submarine cable in the port, which was perfectly clean. New York, Jan. 3, UPI--The battle-wise "All-American" 82nd Airborne Division returned home in triumph today aboard the Queen Mary ready to march up Fifth Avenue Jan. 12 in the greatest victory parade of the war. Also aboard the British superliner was a set of seven-month-old triplets and their war-bride mother, Mrs. Robert H. Glass, an American Red Cross worker. 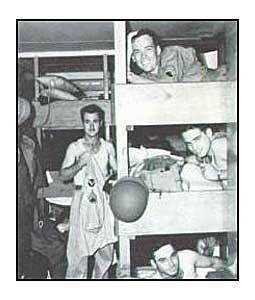 The babies, in bassinettes, were carried down the gangplank by three GI's. The high-spirited 82nd "adopted" the children during the crossing, collecting an estimated $3,000 as an educational fund for them. Carrying rifles and helmets, the 8,800 smartly-uniformed members of the renowned airborne division will fulfill a "battlefield dream" when they parade up Fifth Avenue, their commanding general said. "We'd say: 'when we get back we'll parade right up Fifth Avenue," reminisced the officer, six-foot Maj. Gen. James M. Gavin. "We've walked all over this damned world and we're going to walk all the way." 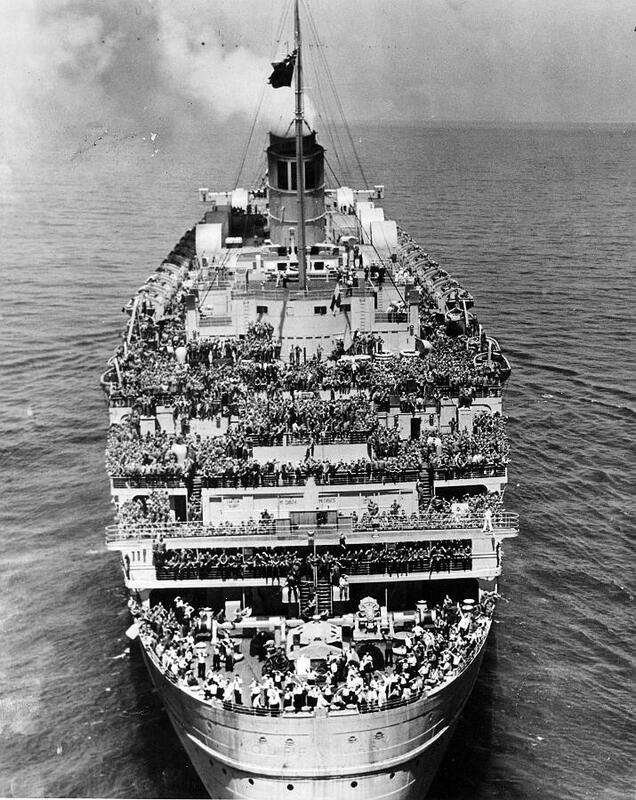 The Queen Mary was at the head of a fleet of 11 troopships bringing to New York a total of 30,837 servicemen. "New York is just waiting to tear you apart!" First to debark were members of the 82nd's honor company, the Anti-Tank Company of the 325th Glider Infantry. Smartly equipped with white gloves, pistol belts, bayonet scabbards and boot-laces, the company was reviewed by the mayor and Gavin. Only about 700 or 800 men were originally with the 82nd. The remainder being replacements. The division suffered 13,000 casualties in action in Sicily, Italy, France and The Netherlands. Three thousand were killed. Aboard the Queen Mary, Jan. 2 (U.P.) --This giant ocean liner taking Prime Minister Churchill to see President-elect Eisenhower ran toward heavy weather in mid-Atlantic today. Though the seas calmed a bit today storms are expected ahead and guide ropes were strung on decks and in lounges to help passengers keep their feet. A number of people are seasick already--but sturdy 78-year-old Churchill took it in his stride. This morning he breakfasted on a grilled Dover sole, then worked in his cabin on the last volume of his memoirs, dictating to a relay of secretaries. At noon a barber went to his suite to trim his white hair. He interrupted his work to go to the bridge to chat with the Queen Mary's master, Capt. Ivor Thompson. The liner was plowing steadily westward at 27 knots today. If she keeps her schedule in the heavy weather ahead, she will dock in New York Monday. Churchill is expected to see Eisenhower Tuesday. 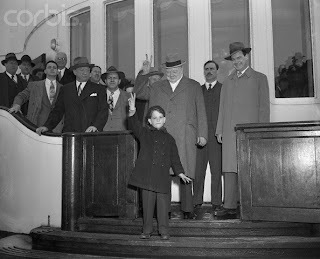 Churchill had welcomed the New Year with a pledge of closer British-American ties. He joined in the New Year's Eve festivities, but lost no time getting back to work. 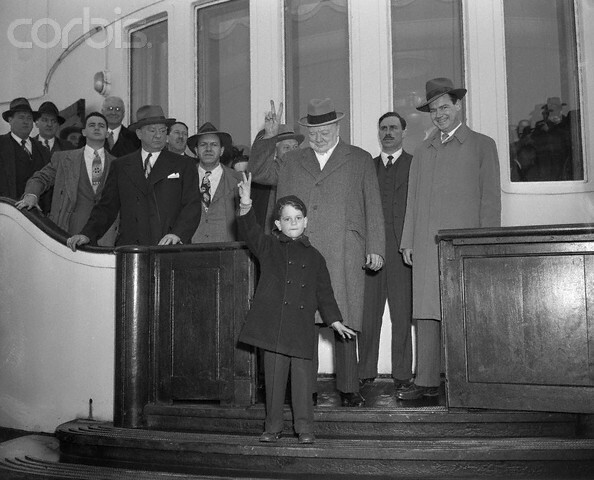 Southampton, England, Jan. 1 -- (Reuters) -- Detectives boarded the liner Queen Mary when she docked here from New York today to investigate the loss of five fur-lined mackintoshes belonging to members of the Canadian skiing team, who are on their way to Switzerland. The Mackintoshes were missed during the voyage but they possibly were stolen before the Queen Mary left New York.